K-Line is a revolutionary flexible hose line sprinkler irrigation system designed to reduce the time and money you spend on irrigation. 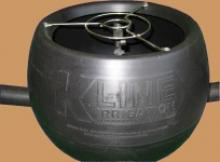 At the heart of the system is a series of small, tough plastic pods protecting a small sprinkler firmly attached to special K-Line low density poly pipe. The system can run on low pressure and is designed to distribute water on a slow absorption method for up to a 24 hour period. This eliminates the need to shift irrigation several times a day and allows maximum absorption into the soil without run-off and pooling, all the while using less water much more effectively. Equipped with a 15 metre throw diameter, at a flow rate between 500Litres p/h and 1080Litres p/h depending on the poly pipes used and the available water pressure, the K-Line system can handle any agricultural pasture or turf application. Also available are a variety of nozzle and sprinkler options to further complement the needs of individual usages. Established in 1929, Philmac is a global leader in the design and manufacture of specialist pipe fittings and valves, providing cost-effective solutions for the transfer, control and application of water. Philmac’s products can be found in mines, on farms and rural properties, vineyards, golf courses, domestic and industrial building developments and the reticulated water supplies of towns and cities across North America and the Middle East, the United Kingdom, Europe, Asia and Africa. Philmac developed the world’s first all-plastic compression fittings for polyethylene (PE) pipe in 1968 and its products are now viewed as the international benchmark. Awards include Australian Manufacturer of the Year, South Australian Exporter of the Year, three Australian Design Awards and numerous awards from the South Australian Centre for Manufacturing.